Those people, who are earners of the Name-Allah-the-Essence (Ism-e-Allah-Zaat) , they neither have sleep at night nor do they have peace in the day. Every next hour, a new Destination and new Station is there in Salook. The condition of an Arif is known by Arif only. What will a sensual being would know it? Then, as a piece of advice, he says to the young Seekers that 'O Seeker! Engage into the Worship of Allah Almighty and remain busy in it. Your youth is getting wasted'. 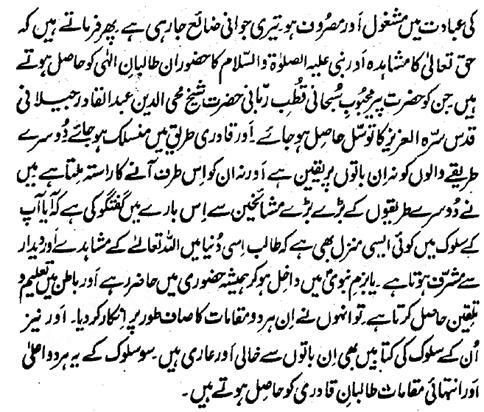 Then he says that 'the Mushahida of Almighty Haq and the Hazoor of the Holy Prophet of Allah Hazrat Muhammad Sal Allahu Alaihe Wa Aa-lehee Wa-sallam are got by those Seekers of Lord, the Tawassal (Waseela) of Hazrat Mahboob e Subhani, Qutab e Rabbani, Ghaus e Samadani Hazrat Shaikh Muhyiddeen Sayyed Abdul-Qadir-Jelaani (Qaddas-Allahu Sirru-hul Aziz ) and he joins with the Qadiri Sufi Order. Persons of other Sufi Orders, neither believe in these things nor do they find a way to come towards these. I have a dialogue with big Sheiks of other Orders concerning this that if there exists any such Destination in their Salook that the Seeker is honored with the seeing the Mushahida and Didaar of Allah Almighty in this world or he may enter the Majlis of the Holy Prophet of Allah Hazrat Muhammad Sal Allahu Alaihe Wa Aa-lehee Wa-sallam and may remain present there forever and may achieve teaching and Talqeen in the Inward? They have clearly denied these two Stations. In addition, the books of their Salook are also helpless and empty regarding these two things. 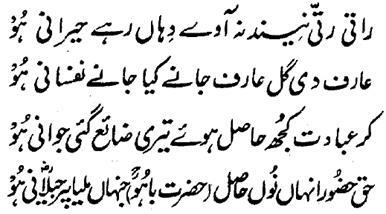 Hence, these highest and extreme Maratib are endowed upon only the Qadiri Seekers.